Based on reviews from 142 users. 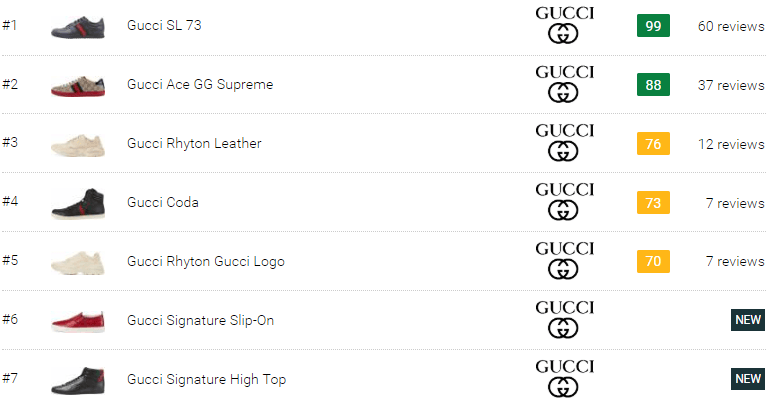 Learn how our rankings work or see our guide to Gucci Fashion Sneakers sneakers. Updated Apr 2019. As cliché as it may sound, "two (or more) heads are better than one." It seems that with this mantra in mind, partnerships, for that matter, are naturally instilled in human nature. Taking a closer look at sneakers, collaborations created such considerable changes in different aspects like design, marketing, culture, etc. From how things started with hip-hop group Run D.M.C. and Adidas, fusion projects have slowly diversified from retailers, athletes, celebrities, fictional characters, movies, and video games. It also proves that instead of treating each brand as a competition, joining of ideas is a much more viable and successful move in the sneaker industry. Like all releases, some being successful and a failure, sneaker collaborations continue to surprise not only sneakerheads but those that are fans of both brands. It is also a great chance to inject change and keep the market excited and have something to look out for. Even so, some of the most expensive releases are from collab projects. With the history of sneaker team-ups, projects like collabs become a chance for footwear brands to showcase new silhouettes but more often than not, looking at the archives or existing silhouettes becomes the usual choice. With this in mind, designers know that before coming up with any design, having a great foundation is a must. Gucci, as one of the most influential, progressive, and innovative brands, formulated silhouettes that stand each on its own. Moreover, the vision of its new creative director Alessandro Michele, opened Gucci fashion sneakers to be interpreted in unimaginable ways. Currently housing only limited models, each is unique and becomes an excellent canvas for each designer to play around with. Given the success of most of the Gucci fashion sneakers, iconic is one of the most easily thrown off words to describe these shoes. The Ace from Gucci is the brand's current interpretation of a tennis shoe—a white leather upper and low-top silhouette, styled with a signature red and green striping. Because of its simple profile, these Gucci fashion sneakers possess the most reiterations, collaboration or not. If the Gucci Ace comes with an opposite model, it is a no-brainer that it will be the Gucci Rhyton. Inspired by the 90s, dad sneakers are taking over the streets. Although the Balenciaga Triple S pioneered the maximalist sneaker, Gucci also jumped in the game with its own version. The tough and bulky exterior of these Gucci fashion sneakers makes it the brand's version and portal of joining the ugly sneaker trend. These Gucci fashion sneakers take strong influence from retro sports shoes. Like the Gucci Ace, the Falacer comes in leather upper and low-top silhouette, branded with the brand's Web striping. 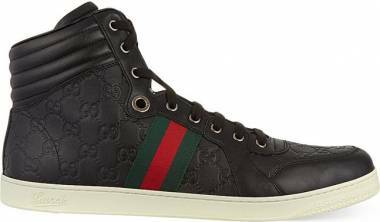 Along with a wide collar to exude that throwback-look, it cannot be denied that these Gucci fashion sneakers sport the impeccable Italian craftsmanship. Gucci, specifically Alessandro Michelle, seems to have a special knack for emerging artists. London-based and self-taught artist Helen Downie, under the moniker Unskilled Worker, is known for her use of vibrant colors and expressive style. The art that she showcased for Gucci featured childlike innocence and an emotional interpretation response to Alessandro Michele's work. The whole collection features a 40-piece capsule, all of which come in whimsical designs. 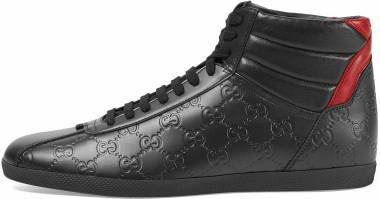 The Gucci fashion sneakers included in the line makes use of the low-top construction of Ace. The Gucci Ace sports a predominantly sky blue background designed with flowers and mushrooms. Every piece in the collection was exclusively released on the brand's website last October 11, 2017. It was the by-product of former Creative Director Frida Gianni and Mark Ronson. Aside from making a mark on the music industry, many are not aware that the artist is also a sneaker enthusiast himself. Unlike most of the Gucci fashion sneakers collaboration, the Ronson shoes are featured on the Gucci Icon-Temporary, a series of pop-up stores happening on six or seven locations. All of the Gucci fashion sneakers housed in these shops are limited-edition. The store opening started in Crosby Street in SoHo with a kick-off party on October 23, 2009. Other stops will be in HongKong, Tokyo, Paris, Berlin, and London. Each customer will get a 12-inch vinyl record when he purchases a Mark Ronson sneaker. Seemingly the most opposite, one pioneering street fashion from its athletic footwear products and the other dominating high-end fashion, it seems that these two could never find its common ground. With both brands banking on their popular stripes, the street and the luxe was able to cross paths. The fusion of Adidas and Gucci makes use of the Adidas NMD's silhouette, which has already made its mark as one of Adidas' most famous and most successful releases to date. It gets Gucci embellishments, including the signature colors and double G logo on the Three Stripes. These Gucci fashion sneakers hold a Primeknit upper and signature Boost sole that elevates its comfort while keeping everything opulent and luxurious. The first release of the Adidas NMD_R1 x Gucci comes in either black or white Primeknit uppers which features signature Gucci hues. It also comes at an affordable price of $130. Who knew that because of his peculiar obsession with the Italian luxury house, ex-Olympic snowboarder turned graffiti artist Trouble Andrew gained a deal with the brand? Trevor Scott earned his nickname GucciGhost based on a Halloween costume. With nothing to wear, he cut off a pair of holes on Gucci bed sheets, to portray the classic image of a ghost, only with Double G's on it. As he walked along the streets of New York, someone blurted out Gucci Ghost, giving him an idea that it could be a fitting name for him. GucciGhost gained a strong following on Instagram as many have appreciated his New York paintings and street art which shows his rendition of the brand. It did not only catch the attention of art enthusiasts but the creative man behind Gucci, Alessandro Michele. Even though it may seem like ridicule, it is merely his influence of the skate culture that inspired him firmly on his creations, which on his benefit, turned into a success. The partnership of Trouble Andrew and Gucci seems highly unlikely at first despite the latter's full range of influences. Scribbled street art is the first for Gucci, but significantly embraced by its following. Included in the line are five different types of footwear – the Princetown Horsebit Mule, high-top sneakers, low-top sneakers, skate shoes, and pool slides, all of which are clad in black and embellished with GucciGhost's graffiti pattern. Although Gucci has been known for its luxurious pieces, its current list of partners seems to be surprising. Disney has been known for its other strings of footwear partners, but its partnership with the Italian powerhouse is definitely one for the books. In the Spring of 2017, Gucci showcased a different interpretation of our childhood favorite giving him a new image as an explorer. The sneaker line features Donald-Duck designed Jacquard High-Tops and horsebit mules. Some of the character's pieces get reinvented; some are sporting oriental and vintage tapestries. The Donald Duck x Gucci included a variety of pieces including sweatshirts, bags, hoodies, and knitwear. Sega's partnership with Puma, embodied by Sonic the Hedgehog, may have made a lot of sense, a match-made in heaven if you may say. However, who would have actually thought that the paths of a video game developer and a high-end luxury brand could cross? No one, which is why this collection came as a great surprise and seemingly a struck of genius that they have created a great collection. Gucci "Bejeweled" - These Gucci fashion sneakers prove that the dad sneaker trend isn't going any wear. If not, it's just getting chunkier and uglier. Clad in a crisscross Bejeweled strap that can be unbuckled based on the user's preference, it is contrasted with an industrial vibe and makes use of the Rhyton's bulky silhouette. To show the components of both brands, the text GUCCI, imprinted using the Sega font, is placed on the tongue. For $1,430, fans can already avail of these unisex Gucci fashion sneakers. Gucci Rhyton Print SEGA- The next release is far more muted than the first. These Gucci fashion sneakers are said to heavily draw on Alessandro Michelle's obsession with the old-school arcade. Like the other Sega shoe, it makes use of the Gucci Rhyton's massive profile. The quarter panel sports a large Gucci Sega-inspired logo. These sneakers approximately retail for $885. Guccy Falacer - The third Gucci fashion sneakers feature the Falacer silhouette which creates a complimentary canvas for Sega's old-school. Released in Spring/Summer 2018, the footwear comes in a black upper designed with gold polka dots all-around. Aside from the throwback style, a wordplay of the brand's logo spelled as "Guccy" is sported on the quarter panel. It may come as a shock especially for Gucci and Dapper Dan fans. But those who are entirely clueless should know the colorful history behind them. Dapper Dan, under the name Daniel Day, is a legendary tailor and ran one of the hottest shops in Harlem from 1982 to 1992. His designs fuse streetwear elements with knock-off high fashion prints. Many termed his style as counterfeiting but injected with a high-level of art. Despite being questionable, Dapper Dan's clientele includes LL Cool J, Mike Tyson, and Rakim, all of which enjoyed the convenience of availing sizes and styles that original high-end brands refuse to produce. In a way, the relationship between Gucci and Dapper Dan illustrates that what goes around comes around. After the lawsuit to the Harlem tailor, the Internet has been shocked when Gucci, on its 2018 Cruise collection, featured a jacket that looked unmistakably similar to Dapper's previous design. That said, Alessandro Michele explained that the piece was to pay homage to the designer. Soon after, collaboration sparked showing that in the world of fashion, everything is possible. The Gucci fashion sneakers included in the group is a mix of high and low-tops. The entire collection highly reflects the hip-hop Harlem streetwear which is a close element to Dapper Dan. Retailers are not strangers when it comes to collaborations, but when it comes to Gucci, each partner should be the best. Mr. Porter is a topnotch menswear online retailer that injects inspirational content and expert advice regarding fashion. The website houses 450 leading international brands and offering express shipping to 170 countries. The capsule collection which features 43 items, is exclusively available at Mr. Porter.com. The Gucci fashion sneakers included in the line use the Ace as its canvas, decorated with a wallpaper-like GG print. The yellow leather upper makes it a showstopper, true to Alessandro Michele's style. With Alessandro Michele taking over as Gucci's creative director, the brand made use of different marketing platforms and created projects utilizing these venues, one of them being the #24HourAce. Unlike usual marketing strategies that relied on print, this project makes the most out of digital portals like the brand's Snapchat, Instagram, and website. Artists from around the world explain in a one-minute video about how they have collaborated with the brand and their interpretation of the famous Gucci Ace sneaker. Results of the project are posted on the brand's Instagram and Youtube page. Are there ways to detect counterfeit shoes? Check the serial number on the inner lining. Authentic Gucci fashion sneakers should have an 8-digit serial that is stamped on the inner lining of the shoe. A "Gucci Made in Italy" should also be seen on the lining. The good old scratch and sniff test does the trick as Gucci only uses real leather. Be vigilant about the quality of the craftsmanship too. This Italian fashion house, collaboration or not, knows that every detail should be well-made, including the lining and the stitching. Price should be an indicator of fake goods. Those that are way below the usual price range are definitely a red flag. Why are sneaker collaborations extremely more expensive? They are released in limited quantities and companies, most of the time, stop the production after it has been sold out. These partnerships present a sense of prestige. Not anyone can gain a partnership with a brand, mass-produced or not. What makes Gucci fashion sneaker collaborations special? There is no denying that like other collaborations, Gucci fashion sneakers fused with another brand, retailer, or artist, creates hype like no other. Whether you are a sneakerhead or not, projects like this is not only a great marketing opportunity but it is also a chance to tell a story. Whether it becomes an occasion for the brand to showcase a new silhouette or interpret existing sneakers, each sneaker is designed extensively and it undergoes through great miles before the release. For a brand like Gucci that is reputable for its exquisite taste, collaborations become extremely special because users know that its designs are professionally interpreted by world-renowned designers. Where can I buy collaboration footwear online? More recent releases of Gucci fashion sneakers are usually offered on Gucci.com. However, because most of them are released in limited quantities, it can be sold out quickly. It is suggested that for the purchasers who want to avail of a piece should purchase as soon as the release date is announced. Other online retailers include Ssense.com and Net-a-Porter. What makes Gucci unique among other footwear brands? One of the reasons why Gucci has become what it is today is it's because it is the leading Italian Shoe Manufacturer. This being attached to the brand connotes the highest level of quality, craftsmanship, and style. Italian designers are reputable to produce the best kind in the world as they extensively know the anatomy of the leg and foot. Italian designers are also known to use traditional methods of shoe-making, including the tanning of the leather, hand-sewing, and using of premium materials on each part of the shoe. Because of this, Gucci has earned the legacy and the sign of prestige in all the products that they release. Since January 2015, with the support of Gucci's CEO Marco Bizzarri, Alessandro Michele has been appointed as the company's new creative director. His eclectic sense of style and extensive use of vintage style contributed to the exponential growth of the Italian luxury house. His designation entails that he is responsible for all the product categories, the company's global brand image, and collections. With less than a year on his reign, the designer was already awarded by the British Fashion Council the 2015 International Designer award at the British Fashion Awards. The year after, he was bestowed the International Award by the CFDA and the British GQ Designer of the Year Award. How does Gucci footwear fit? Based on the feedback of most, Gucci sneakers tend to run a half or a half size bigger. It is also important to note that when ordering online, especially on the Gucci website, they have their sizing but a translation to the US sizing is provided to help the consumers find the right one for them. In our website, the US sizing is indicated. Should I worry that the collaboration sneakers will not last as long as other Gucci fashion sneakers? Even collab shoes that have a Gucci stamp on it should ensure its users that it sports the same level of quality and craftsmanship that each of its footwear has. Its legacy as the producer of utmost-quality leather products backed up its tradition and history with leather goods, makes its sneakers guaranteed to stand the test of time. Putting the highest standard on their footwear sets them apart from other mass-produced pieces. How should I clean my sneakers without ruining it? Brush the upper and midsole of the shoe with a soft bristled brush and toothbrush for hard to reach areas. It will remove the dust and dirt on the surface of the shoe. Don't let the dirt build up. Spot cleaning your trainers as soon as you see some dirt will be a better move. For tougher stains or dirt, combining warm water with a small amount of detergent cleaned with a non-abrasive cloth should get most out of the Gucci fashion sneakers. Do not forget to remove the laces. With a dry washcloth, wipe the sneaker and let it air dry. The shoelaces can be cleaned with warm water and detergent as well. Spraying your shoe with a protectant will also provide longer life to your sneakers. 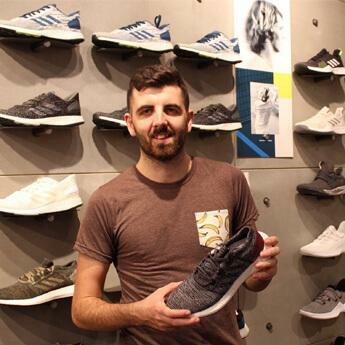 The brand also suggests filling the inside of the shoe with tissue paper to help aid maintain the shoe's shape and help with the absorption of humidity. Like most of the luxury fashion houses, Gucci is owned by the global luxury group, Kering. Other brands under their umbrella are Alexander McQueen, Bottega Veneta, Balenciaga, and Saint Laurent. Despite having many luxury brands under its belt, Kering empowers its Maisons the freedom of creative expression to craft the future definition of luxury in a responsible and sustainable method. Can women-designed sneakers be worn by men and vice versa? Although some of the collaboration Gucci fashion sneakers are made with men and women's sizes, those that are exclusively made for men or women can be worn by the other as it is not limiting. Keep in mind the conversion of the sizes, especially when ordering online.